I stopped for a short visit at Walt O’Brien’s studio the other day and there were some very nice images on the walls taken at a lake I had never heard of. I asked Walt about the location and it turned out it was relatively close to Eugene – in the Coast Range. I followed Hwy. 36 west – stopped at the Low Pass store for directions – pretty easy and accurate and drove on to the cutoff for the map dot of Horton – at least I think I went thru Horton – hard to tell. At Horton (not a Who in sight!) the road splits and I took the right fork and in a few miles came to Hult Lake which I found out is also called Horton Pond and is basically a reservoir. This was a bit of scouting trip for future photo opportunities but I luckily found the lake shrouded in fog. I shot my way along the shore and found some places that I think will be great come the autumn color. 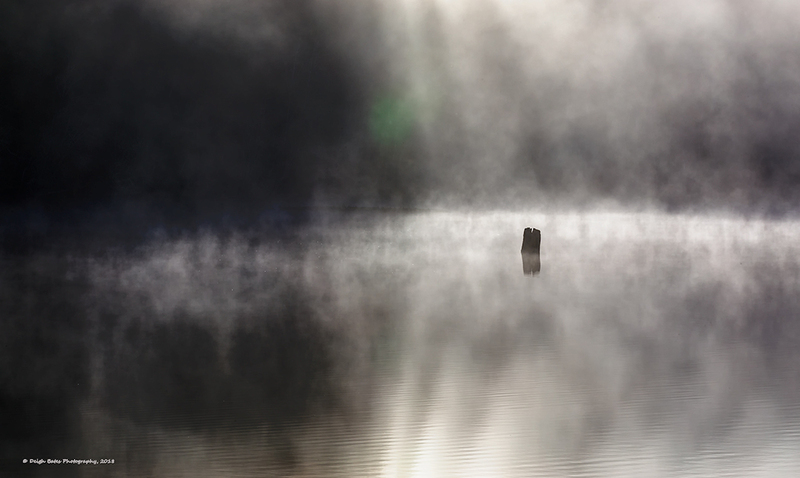 The image below was taken after about an hour of shooting and was as the morning sun was just beginning to burn off the fog coating the lake. If you click on the image to get a larger view I think it is better. I welcome your comments here or on FB.